This morning, I just got back from a trip to Eataly in New York, a place where I feel like I am home. There is no better place to discover the taste of Italy, in my opinion – the wines, the pastas, the meats, and cheeses. 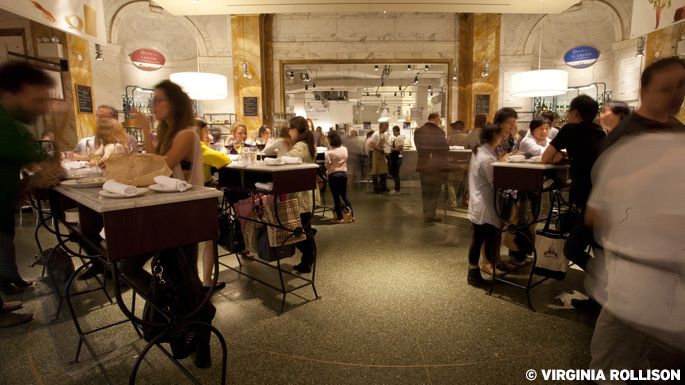 We started Eataly ten years ago and since then have opened up stores in New York, Chicago, Los Angeles, and Boston. I walk in and I follow my nose – through the coffee and chocolates, to the fresh mozzarella, then to the meat and cheese counter where they are slicing and serving some of the best most flavorful items. Eataly is more than a market – it’s a school, an experience, and a table to gather around: a place to learn about food and, through food, about life. Head over to Eataly and Enjoy! Broccoli rabe and sausage seem like a match made in heaven. They go well together with pasta or on a loaf of Italian bread. The broccoli and sausage pieces get into the crevices of the pasta, and when they’re served on bread, the olive oil is immediately soaked up. 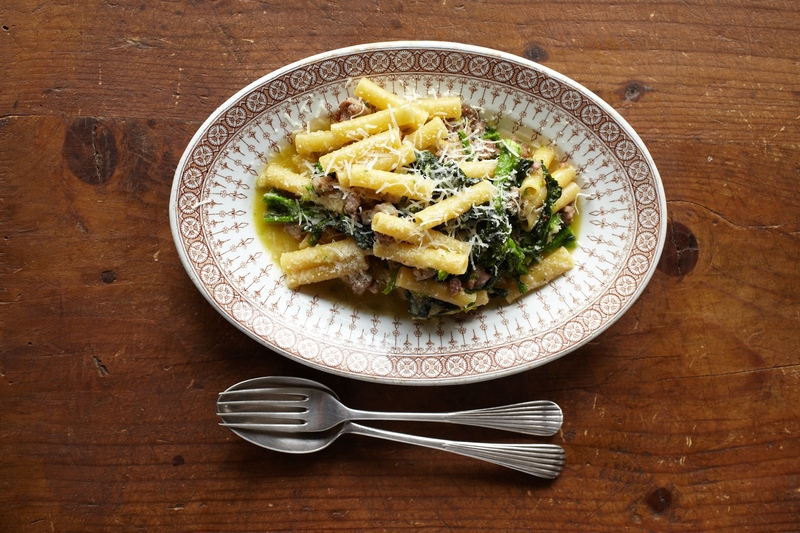 Even though the bitter and unfamiliar broccoli rabe might not have been an American favorite a few decades ago, when it first appeared in California’s Salinas Valley, it certainly has become a favorite ingredient for Italians and Americans today. Heat the olive oil in a large, deep, heavy skillet with a fitted lid, then toss in the garlic and sauté, uncovered, until golden—about 2 minutes. Bring a large pot of salted water to a rolling boil. When you are ready and the water is boiling, add the ziti to the pot and cook until al dente. Meanwhile, add the sausage meat to the oil and garlic, and cook, stirring, until golden, about 5 minutes. Add the broccoli rabe, 1 cup pasta-boiling water, ¼ teaspoon salt, and the pepper flakes; cover, and steam 5 minutes, stirring occasionally. Cook the sauce uncovered over high heat for about 3 minutes, until the liquids are slightly reduced. Drain the pasta, add it to the sauce, and toss gently. Sprinkle on half of the cheese, toss again, and distribute the remaining cheese over the pasta. Serve immediately.